It’s true: Fallout Shelter is an interactive advertisement for Bethesda’s upcoming blockbuster console release, Fallout 4, complete with the franchise’s undeniably cute 1950s Pip-Boy art style. Unlike a lot of people though, I’m totally fine with this because Fallout Shelter is a great game, even if you aren’t a fan of the Fallout universe. Here’s why. While some might scoff at Montreal-based Behaviour Interactive and Bethesda Studios’ Fallout Shelter because of its simplicity (it can be mastered in only a few hours), the game has managed to accomplish something I thought was impossible; the studios behind the project have created a touchscreen real-time strategy title that actually makes sense. In Fallout Shelter, the player takes on the role of a Vault overseer with a number of responsibilities. You’re in charge of ensuring your dwellers have adequate water supply, enough food, the ability to defend themselves from the radioactive “Wasteland” outside, and perhaps most importantly, sufficient electricity. This is accomplished by assigning dwellers to take on different tasks in your Vault, and depending on how much you’ve upgraded your facilities, multiple residents can be given the same role in a room. This makes that section of your Vault produce whatever resource it’s designed to create – water, electricity, or med kits, for example – significantly faster. The rate at which resources are created can also be sped up to produce materials in only a few seconds, but doing so runs the risk of causing various disasters in your Vault. However, if you’re in a jam and need resources right away, pressing “Rush” can be helpful and necessary. Only use this feature as a last resort though because it often leads to disaster. 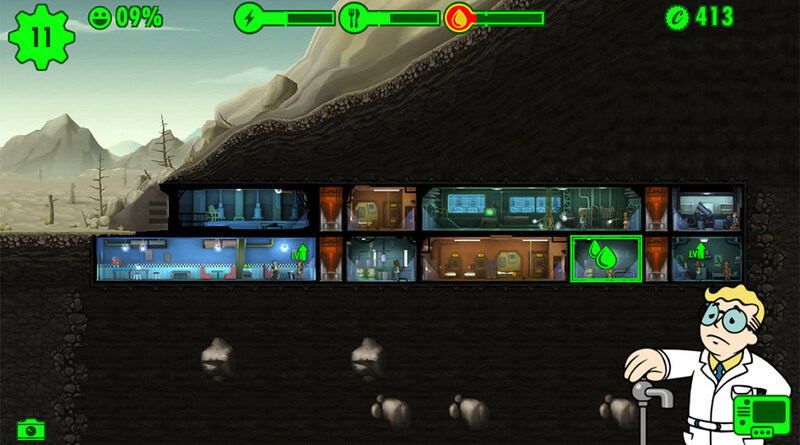 More than once my impatience caused the population of my entire Vault to be destroyed (dead characters can be revived for a fee), forcing me to downsize my underground kingdom significantly and wait two real-time hours for a dweller to return from exploring the Wasteland (they sure were in for a surprise when they finally got back). 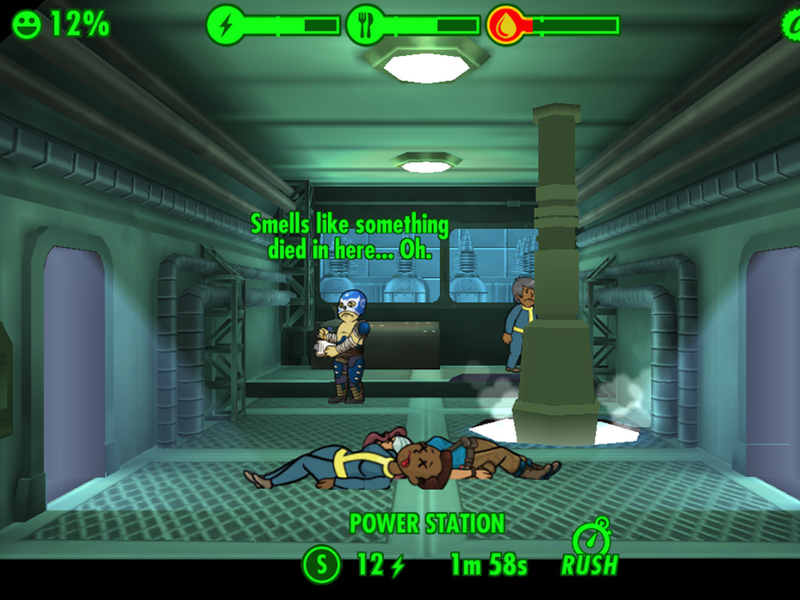 Fallout Shelter’s gameplay also includes a variety of other nuances. For example, male and female characters can be placed in living quarters together in order to create offspring and increase your Vault’s population. Additionally, Intrepid dwellers can be tasked with heading out into the Wasteland (hopefully equipped with a powerful weapon), in order to retrieve rare items and bring them back to your Vault. 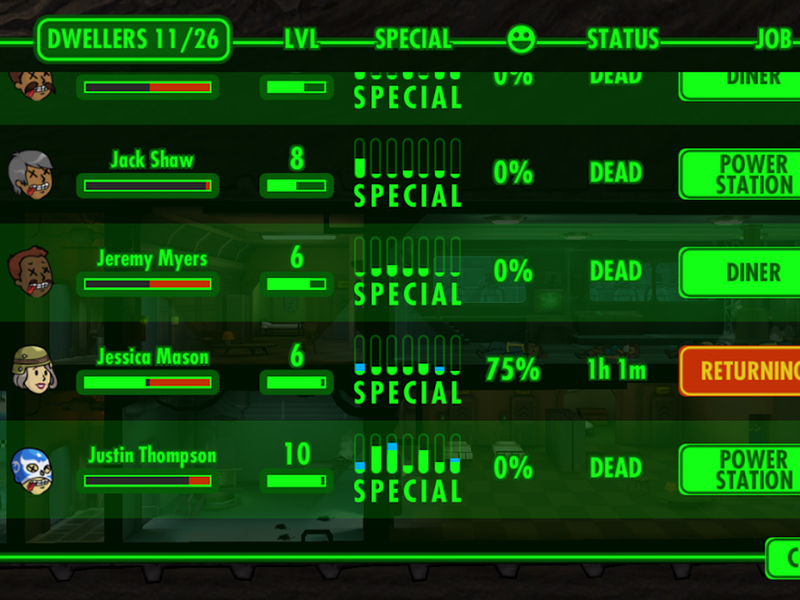 A big part of what sets Fallout Shelter apart from other similar titles is how easy it is to control. 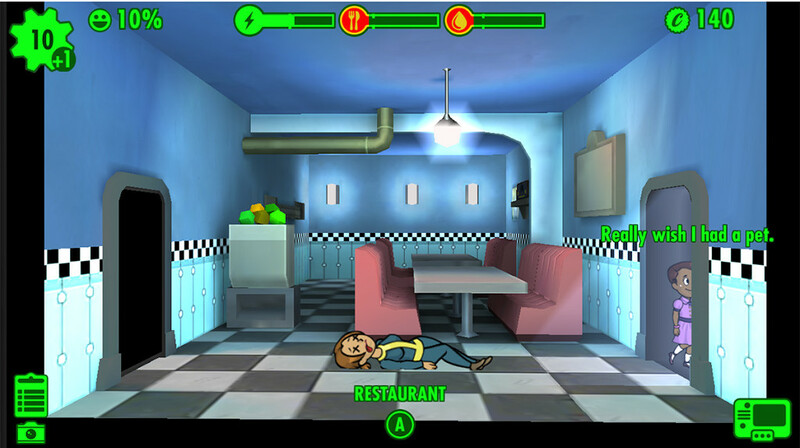 Moving the citizens of your Vault around involves dragging and dropping them in different locations, and most actions in the game can be performed with one or two taps on your mobile device’s touchscreen. When it comes to mobile games, the simpler controls are the better, and Bethesda has but a lot of effort into ensuring Fallout Shelter’s is easy for players to pick up and understand relatively quickly. But despite Fallout Shelter’s accessibility and simplicity, my first few hours with the game were a little confusing. The importance of ensuring I had enough electricity was probably one of the earliest lessons I learned in Fallout Shelter. If your power supply runs out, rooms will shut down, which means you won’t be able to supply your residents with other necessities of life. I also quickly learned to move all of my Vault dwellers in unison to take on fires and vicious Radroaches, especially when my Vault’s population was low; in the Vault there is power in numbers. It’s also sometimes it’s hard to tell exactly why your Vault dwellers are upset, which can lead to frustration. It’s important to keep in mind that while Fallout Shelter is free-to-play, the game’s micro-transactions aren’t necessary or intrusive. Players are given the option to purchase “Lunchboxes” that range in price, from $0.99 and $19.99. These Lunchboxes give players new items, extra Caps (the Fallout series’ bottle cap money) and Shelter Cards, which can in turn be used to unlock rare items. Like all great free-to-play games, players don’t need to opt into the paid aspects of Fallout Shelter to move forward, but they are there as an option for those with extra money or who don’t have patience to build up their Vault. 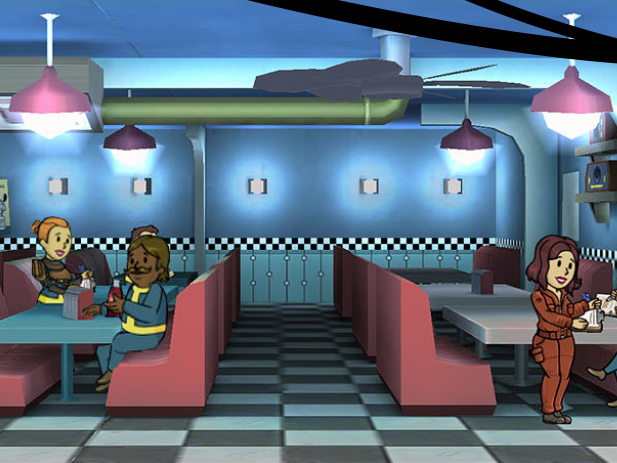 Where Fallout Shelter begins to fall apart is in its depth – or lack thereof. It doesn’t matter if you have 10 dwellers or 100, the game plays nearly identical and once you’ve mastered its fundamentals and quickly becomes unchallenging. But Bethesda seems to be aware of this issue, at least to some extent. 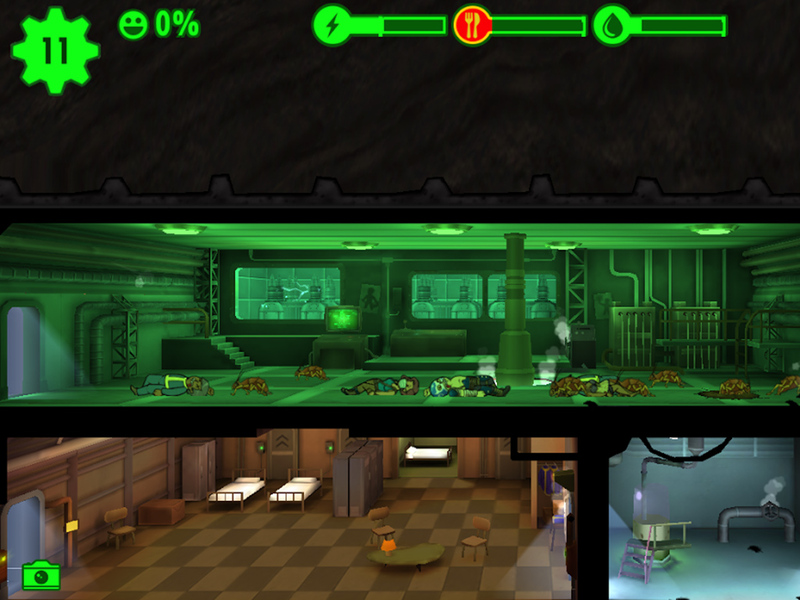 The launch of the Android version of Fallout Shelter also marks the release of an update that brings more obstacles for Vault overseers to deal with. New enemies like Mole Rats and Deathclaws will now attack Vaults, and Raiders have the ability to steal caps. A personal assistant called Mr. Handy has also been added to the game (Fallout fans will remember this character from Fallout 3). It’s still unclear if these new features will add enough to Fallout Shelter to maintain or renew the interest of players who have already maxed out their Vaults, but they seem like a step in the right direction for Bethesda. If you set your expectations appropriately surrounding how deep Fallout Shelter really is, you’ll likely have a good time with Fallout Shelter. But if you’re hoping for a multi-layered simulation experience, Fallout Shelter probably isn’t the game for you. 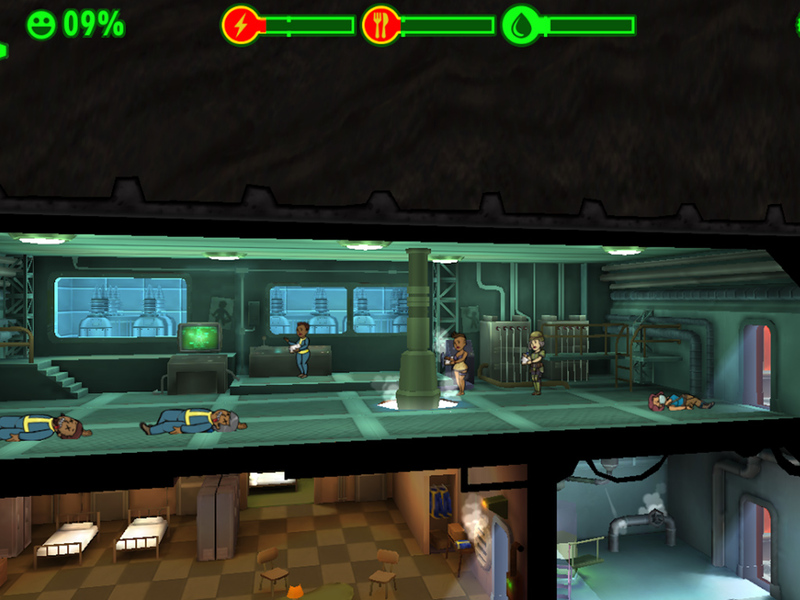 For this review I played the iOS version of Fallout Shelter. During the 20 minutes I spent with the Android version of Fallout Shelter, I didn’t run into any technical difficulties and the game performed the same as its iOS counterpart. Fallout Shelter is available on Android and iOS for free. Find Patrick O’Rourke on Twitter.